This week, we spoke with Melanie Berg, designer of all things chic and contemporary. We love her designs and knit them ourselves; to see all of Melanie’s patterns, click here. Hello Melanie! Tell us a little bit about yourself! 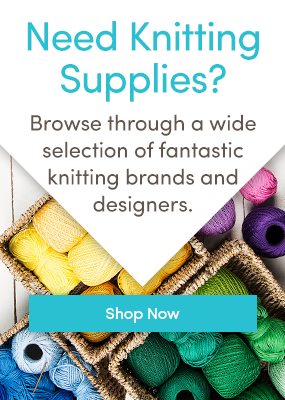 Hi there LoveKnitting, thanks for having me today! I’m a thirty-something year old girl from Germany and I love to knit! I live here with my husband, our three children, aged 3, 4 and 5, and a lot of yarn in this house. My days are filled with taking care of the kids and playing around with a lot of yarn, experimenting with new ideas and collaborating with other knitters around the world. My mother taught me how to knit when I was a young teenager, but after I made a horrible, curling stockinette scarf, I put the needles down for a while. It was only when my first daughter was born that I picked them up again – I wanted to create something for her, something that I had made myself, that would protect her and keep her warm. I’ve been a knitter ever since then! You’re an IT-specialist by day we hear! How did you get into knitwear design? I’ve actually quit my IT job well over a year ago to become a fulltime designer. Things were getting too much for me to handle – my day job, three little kids plus all the time that went into knitwear design. One of these had to go. Obviously not the kids, and not the knitting either, so I decided to quit the day job! It’s been a great decision that has allowed me to spend so much more relaxed time with my family and with my second career, and I really appreciate this. So how did I get into knitwear design in the first place? It was a very organic progression, I think. As soon as I started knitting for my daughter, I tweaked the patterns that I had been following. I added little details here and there, changed some things, left others out. That felt very natural to me and I was never afraid the outcome might be bad – if that was the case, you could always simply rip out your work and start over, couldn’t you? This wouldn’t be the end of the world. So from there on, it’s not been a far way to come up with my own patterns. I soon started to write them down, and thanks to platforms like LoveKnitting and Ravelry, it was easy to share them with the knitting world! Colors are usually an important element of my designs – either in funky combinations or on a muted palette that makes for timeless pieces. And while I do appreciate a challenging knit from time to time, I often find myself drawn to the easier ones. The ideal pattern for me is one that is not too complicated, one that allows your thoughts to wander off and daydream while working on it, but that keeps you entertained throughout the process and results in a beautiful finished object that you love to wear. Drachenfels, Ashburn and Moonraker are my most popular shawl designs, and all three of them are great examples of the design style that I mention in the last question. They play with colors, are easy to knit and result in greatly wearable shawls. Which of your patterns would you recommend to a knitter just starting out? Are there any techniques you haven’t tried designing with that you’d like to? Tons! I’ve never ventured into double face knitting – a technique that I find intriguing for its beautiful results, and I’d love to try out Tunisian Crochet once. I find very little knitting time for myself, which is really bad. But it’s been my New Year’s resolution to spend more time knitting other designers’ patterns and I’ve actually finished a sweater for myself not long ago. Another one is on my needles right now – the Hitofude cardigan. I don’t think I’ll seriously find the time to finish it before next spring, though. Well, I’m working on a couple of new patterns at the moment! There will be a collection coming out in August this year, and also a couple of individual patterns – self-published ones, but also in magazines. I have a lot of beautiful, hand-dyed yarn at home to play with, so stay tuned for some more Mairlynd designs. If I were a yarn, I’d like to be one that came off a New Zealand sheep – it’s a truly fascinating country and I’d love to go there one day. Don’t miss out on Melanie Berg’s Easy Lace ebook! Check out the rest of Melanie Berg’s patterns by clicking here! Missed the LoveKnitting Take Over with Melanie? Don’t worry! You can still enjoy it so grab a cuppa and re-live her photo diary over on our Instagram and Pinterest pages. Last updated: May 8th, 2015. It is nice to meet Melanie. Your designs are amazing. I have admired the Ropedance shawl. Just visually beautiful. I am new to crotching and yet to learn to knit but your designs have inspired to do so. I’ve been ‘practising’ knitting for a while now. Something keeps holding me back from knitting to pattern but Melanie Berg’s fabulous designs have really inspired me. Love this blog, thanks!